UDM Downloads > PDF Creator Pro! 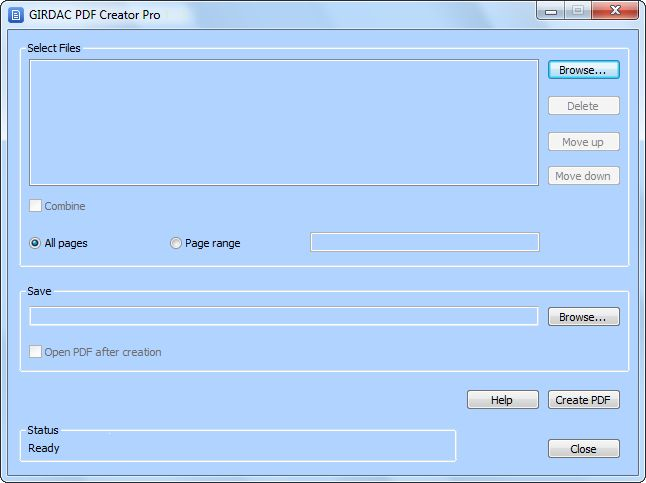 GIRDAC PDF Creator Pro creates PDF documents. It creates PDF file from Microsoft Word, Excel and PowerPoint files. It creates PDF file from any printable file. It creates PDF file by simply dragging and dropping Microsoft Word, Excel and PowerPoint files. It combines multiple documents to create a single PDF file. It adds custom watermarks to PDF file. It protects PDF document from viewing, editing, copying or modifying through password. It secures PDF file by applying 128-bit encryption algorithm. It sets PDF document properties: Title, Author, Subject, Keywords, date and time created, date and time modified, PDF version, application name, and PDF producer. It sets PDF default view settings: Zoom, Page Display, Page Mode, Open Page Number, and Page Rotation. It creates PDF A/1-b documents in compliance with ISO 19005-1 archiving standards. It optimizes PDF document for different purposes. It supports both 32-bit and 64-bit operating systems. It supports 60 user interface languages: Afrikaans, Albanian, Arabic, Armenian, Belarusian, Bulgarian, Catalan, Chinese, Chinese Simple, Croatian, Czech, Danish, Dutch, English, Esperanto, Estonian, Farsi, Finnish, French, Galician, German, Greek, Hebrew, Hindi, Hungarian, Icelandic, Indonesian, Irish, Italian, Japanese, Kannada, Korean, Latin, Latvian, Lithuanian, Macedonian, Malay, Maltese, Norwegian, Papiamentu, Pashto, Polish, Portuguese, Romanian, Russian, Serbian, Slovak, Slovenian, Spanish, Swahili, Swedish, Telugu, Thai, Turkish, Ukrainian Urdu, Vietnamese, Welsh and Yiddish. It provides four Interface styles: Windows 7 Blue, Black, Aqua and Silver. Its trial version creates twenty PDF files with a green color footer.